Things are starting to get old with the Rockets, losing another game in the fourth quarter after holding a lead. Leading by one point with 3 1/2 minutes to go, the Rockets still lost 107-99 at Toyota Center to the New Orleans Hornets last night. The Rockets are now 0-4 to start the season, and are starting to remind me of the UT Longhorns and the Dallas Cowboys — so much promise to start the season, but failing terribly to live up to expectations. At least for the Rockets there are still 78 games to play to right the ship. Remember the 22-game winning streak a few seasons ago? A streak just 1/3rd that long will make everyone forget about this bad start. You’ve got to wonder if the Rockets’ problems executing in the fourth quarter is starting to make the Rockets want to get a Carmelo Anthony deal done sooner than later. I still don’t think Carmelo is the answer since the Rockets need more defense, not offense. And bringing in a ballhog would only make things worse. As far as Yao’s game went, it was actually pretty good: 15 points in 21 1/2 minutes on 5-of-11 shooting, 5-of-5 from the line, five boards, and two blocks. In crunch time, he took a baseline shot that missed, and then was replaced in the game by Jordan Hill (who had a good game with 9 boards and 3 blocks) after not grabbing a rebound that resulted in Chris Paul hitting a 3-pointer. 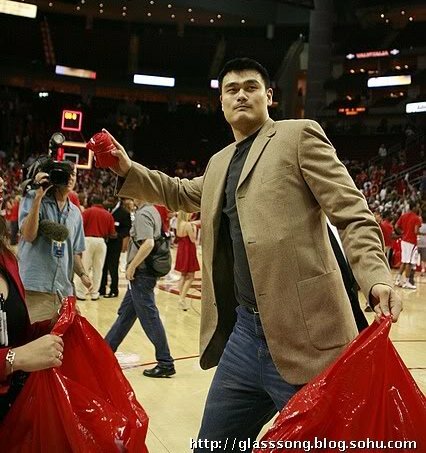 To be fair to Yao, he wasn’t the only player who didn’t grab a board when they needed it. But it was a surprise that he finished the game about 1 1/2 minutes below his allotted 24 minutes. It doesn’t get any easier with the Rockets playing the Spurs next in San Antonio Saturday night. Something tells me the Rockets are going to “rise up” and surprise the Spurs and steal a win there. Right when people start counting the Rockets out, they have a tendency to bounce back. 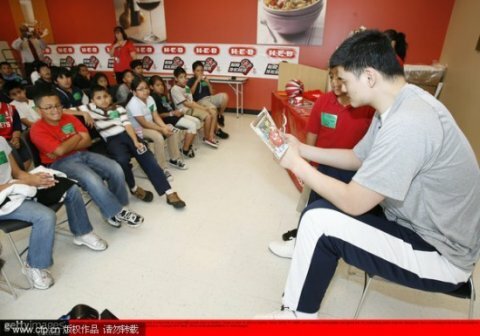 Working back in time, a week ago Thursday (April 15th), Yao read to some Houston school kids as part of the NBA’s “Read to Achieve” program at a local HEB grocery store. Click here for more photos from Yao’s reading to the kids. The night before, Yao attended the Rockets’ final game of the season (played against the New Orleans Hornets), which was also Fan Appreciation Night. Before the game, Yao handed out popcorn to fans…. …then after the game, threw T-shirts into the crowd…. Click here for more photos from Yao’s Fan Appreciation Night activities. On the Shanghai MAXXIS Sharks front, as you know, they lost their playoff series about 12 days ago against the Guangdong Tigers. The Sharks players, coaching staff, significant others, sponsors, officials from the Shanghai Municipal Sports Bureau, etc., got together for a cruise on the Huangpu River. Click here for more photos from the Sharks get-together. – Each player, including the expats, had a 1-on-1 discussion with coach Bob Donewald, Jr. and senior management on April 13 to talk about their individual performances for the season and improvements needed. Players were also free to provide input on how the club could be improved. – Starting April 14, players have been given 3-5 weeks of vacation time, but the team is still adopting an “active rest” strategy where each player is asked to maintain a certain amount of exercise each day during their vacation: hitting the gym, jogging, cycling, swimming and so on. – When players report back to the club after the vacation, a scenic spot with historical and cultural significance (tentatively Yunnan) will be chosen for 10 days to 2 weeks of physical training that won’t include basketball activities. – Basketball training will follow after the physical training, then some invitational games will be played. Select players will be sent to overseas training camps in Taiwan, Australia, the USA and Europe. 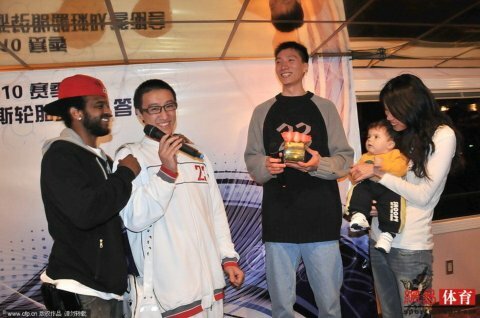 In addition, players will participate in a series of community/charity activities, including visiting the 2010 Shanghai EXPO, and the counseling of young players. – After this training, the players will get a break to relax. Then one month before the start of the new season, the players will report back to the club to begin their preseason training. Finally, it’s reported that the Sharks coach Bob Donewald, Jr. may be tapped to become the Chinese National Team coach, although Yao has him signed to a 3-year contract, but could release him from the contract temporarily. We’ll be following closely to see what happens. I have to admit the Rockets’ decimation of the New Orleans Hornets Monday surprised me. I thought with all that was at stake for the Hornets in regards to playoff positioning, there would be much more of a fight. But something happened along the way. The Rockets played one of their finest games of the season, out-hustling the Hornets on the boards 46-37, dishing 21 assists on their way to 34 field goals, holding an opponent to a season low in points, and they now find themselves only 1 game away from winning the Southwest Division over the Spurs since the 1993-94 season. 31 minutes. Click here for more photos from the game. Full of confidence they can handle their division rivals to the east, they turned CP3 more into CP3O (or the much shorter r2d2? ), holding Chris Paul to 9 points and 7 assists in about 30 minutes of action. Paul normally shoots 51% from the field against the rest of the league, but in the 2 games against Houston since the Rafer Alston trade, Aaron Brooks and Kirk Lowry have held him to 41% shooting. Case in point: I loved the block that Lowry had on CP3 midway through the second quarter on a fast break, tracking him down, jumping high and blocking it at the peak of Paul’s leap. Lowry would block him again from behind later in the second quarter, but the refs blew the call by blowing a whistle on Lowry for a foul, which was bogus. It doesn’t really matter much that Brooks and Lowry would score 5 and 4 points respectively. They held Paul to the sum of their collective points to neutralize him. You can’t ask for much more than that when playing an All-Star like Paul. The game was pretty much in hand for the Rockets when they went on an 18-0 run WITH THEIR RESERVES to take a 43-31 lead in the second quarter. The Rockets would extend it to 20+ points in the third quarter, the Hornets would miss 17 of 18 shots during a big stretch, and the Rockets rolled the rest of the way. Yao Ming started off hot hitting baseline jumpers and jump hooks guarded one-on-one by a Tyson Chandler-less defense. Without their 7-footer around to contest Yao on the block or in the paint, Yao would have his way with Melvin Ely, scoring 22 points on 8-of-13 shots, grabbing 7 boards, and blocking 2 shots (including an awesome rejection of Sean Marks who challenged Yao at the rim on a dunk attempt) before being pulled halfway through the fourth quarter after logging a little over 31 minutes for the game. Losing Chandler to an injury has really hurt the Hornets down the stretch, who have now lost now 5 of their last 7 games. But give the Rockets’ defense credit for holding the Hornets to 13 points in the second quarter and 11 points in the third on their way to locking them down to 35% shooting overall. The Rockets’ probably would have had a bigger halftime lead than 47-35 if Ron Artest hadn’t had such a bad first half, hitting only 1-of-9 shots and 2-of-13 overall for 9 points. Except for an amazing play in the 3rd quarter where he came around a curl and caught a Shane Battier bounce pass to throw it down one-handed, there were several possessions where he tried to take over, did too much dribbling, and put up bad shots that missed. But the Rockets are so balanced offensively, they can actually withstand a little bit of Artest’s ballhoggish-ness. Not McGrady-like ballhoggish-ness, but Artest’s? You bet. For example, Von Wafer is showing the Rockets don’t miss McGrady’s scoring punch, coming in with instant offense once again to score 9 points, starting with the final shot of the first quarter, and extending his hot streak with 7 more points in the second. He was the main guy who ignited the offense during their 18-0 run. Von can get to the hole at any time with that slashing ability of his, like he did twice during that big scoring run. He’s one of the quickest guys his size I’ve seen get to the rack. When he turns on the jets, it’s almost impossible to stop him. You can’t teach athleticism like that. Wafer would finish 13 points on 6-of-11 shots. All I know is the Rockets better back up the Brinks truck for Von if they want to keep him after this season. Then you’ve got Shane Battier picking up more of the scoring slack lately by racking up 10 points on 4-of-6 shooting, including two 3-pointers, and a nice tip-in off a Yao miss where Shane hustled along the baseline and extended his arm in mid-air from underneath the rim. He also had two very impressive blocks, one rejection coming against David West near the rim, and the other chasing down Rasual Butler on a fast break to block it from behind. I thought I was watching Tayshaun Prince tracking down Reggie Miller for a second! Throw in Carl Landry’s 10 points on 5-of-5 shooting, Luis Scola’s 8 points, and the Rockets can still handle a bad shooting night from one of their top players. At least Artest would make all 5 of his free throw attempts and would dish a team-high 5 assists. You probably couldn’t have picked a worse game for Yao Ming to not play because of flu-like symptoms: a game against a division rival right on their heels with several teams right behind them bunched together vying for home-court advantage in the playoffs. Without Yao, the Rockets sucked it up and won one of their biggest wins of the season (they all seem to be huge these days, don’t they?). It didn’t look like they had a chance at one point: the Rockets’ offense and defense stunk it up as New Orleans went on a 22-3 run stretching from the end of the 2nd quarter to the start of the 3rd. The Rockets missed 13 of 15 shots during that span, and after the Hornets scored on 3 straight alley-oop dunks, it looked like it was going to be a blowout. Ron Artest was terrible, missing his first 11 shots, and I could hear the Ron-Ron critics come out of the woodworks. But being the warrior he is, he stopped settling for jump shots, started attacking the basket, and got it rolling to spark a 95-84 comeback win. Artest would finish with 18 points, all scored in the second half. You’ve got to give credit to a guy who has that much mental strength and fortitude to overcome such a poor start. But it wasn’t just Artest who stepped up: 5 other players scored in double-figures to show just how balanced the Rockets can be. Aaron Brooks (14), Luis Scola (14), Carl Landry (12), Von Wafer (12), and shockingly Shane Battier (11 points). Although he was 1-for-6 from the 3-point line, Battier finally got aggressive by posting up in the lane more, and taking it to the basket and getting fouled where he went 4-for-4 from the line. If Battier just scores 10 points per game like he was doing before he came to the Rockets from Memphis, then that will really help take alot of pressure off the other players, including Artest, to pick up the slack. Major props go to Dikembe Mutombo filling in for Yao. Although he scored only 1 point, his 3 blocked shots — all against Julian Wright — were nice to see to get into the Hornets’ head. His 8 rebounds in 24 1/2 minutes didn’t hurt, either. Dikembe Mutombo blocks the shot of Julian Wright, one of 3 blocks he would have against Wright on the night. Click here for more photos from the game. Other notable stats: Wafer had 5 assists. Scola filled the gap left by Yao’s absence by grabbing 12 boards. The Rockets got back to their good free throw shooting ways, hitting 27-of-31 from the line. Brooks scored 9 points in the first quarter, didn’t take a shot in the second quarter (hardly even handled the ball), but got back to being aggressive and scoring 5 in the second half. That gave AB a respectable showing against Chris Paul, who finished with 29 points on 9-of-21 shots. And through great defense on almost all of their other players, holding the Hornets to 39.7% shooting, the Rockets were able to overcome Yao not being there. Houston is now only 1 1/2 games behind San Antonio (who lost to Oklahoma City Monday night!) for the 2nd seed in the playoffs, but only a game ahead of Portland for the 5th seed, 1 1/2 games ahead of New Orleans for 6th, and 2 games ahead of Utah for the 7th. Every game continues to be HUGE, with Detroit coming into Houston on Wednesday. Although the Rockets did well without Yao Monday night, they need him from here on out. One of the most questionable trades in Rockets’ recent history came back to haunt them Wednesday night when Bonzi Wells torched his former team for 20 points in the fourth quarter and 25 points overall to lead New Orleans to a 90-69 win over the Rockets. The win propelled New Orleans to a 1/2 game lead over Houston, pushing the Rockets from 1st to the 3rd spot in the Western Conference playoff standings. As much as Rocket fans may be gloating they got one over on a division rival like San Antonio by stealing Luis Scola from them, Hornet fans may be doing the same thing toward the Rockets. Houston hasn’t been that charitable to New Orleans since providing help after Katrina. I knew that trade was questionable at best when it happened, even if it got rid of Mike James‘ contract, because you just don’t want to help a team you’re trying to beat in your own division with a player who can play very well when motivated. By the look of things Wednesday night, they are at risk of Bonzi creating even more damage against Western Conference foes. 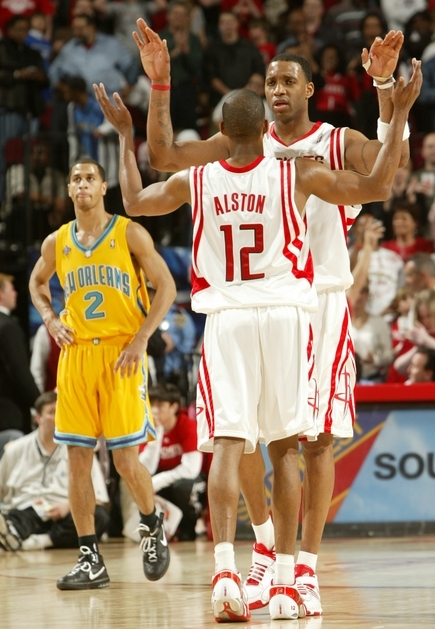 Tracy McGrady and Rafer Alston celebrate as the Rockets distance themselves from the New Orleans Hornets Saturday night and ultimately win 106-96. McGrady and Alston combined for 61 points to extend Houston’s winning streak to 18 games in one of the most exciting games of the season. Unbelievable. Click here for more photos from the game. After each Rockets win during their current winning streak, it has become increasingly difficult to come up with new things to say. You can’t criticize perfection too much. That’s why I decided the other night to make the trip to Houston to attend the Rockets-Hornets game in the flesh since last season’s disappointing Game 7 against Utah. IF the Rockets were to win Saturday’s game, I wanted to see if there was anything different I could write having been there, especially against a very good New Orleans team. Well, it was worth the 320-mile round trip drive (at $3.09 cents per gallon, I might add) to watch one of the most exciting regular season games the Rockets have played this season, even during their 18-game winning streak. Rockets 106, Hornets 96. Absent Carl Landry because of a swollen knee (he should be out only two games, hopefully) the Rockets were now down TWO big men: Yao and Carl. That meant the other Rockets would have to step up even more, and that coasting to a victory was very improbable. You can only lose so many rotation players before it starts to take its toll. They were going to have to scratch out a win, even with Hornets’ All-Star David West out because of a sprained ankle. We hadn’t seen it in such a long time because of all the balanced scoring the Rockets have had during the streak, but Houston decided to go back a bit to the “JVG way” of winning games by having one guy put the team on his back. In this case, it would be Tracy McGrady. It was probably the safest bet to get the victory: ride the hot guy, especially if he’s motivated and wants to prove he can be the guy to do it. Earlier in the day, McGrady learned if the Rockets beat the Hornets that they would move into the third spot in the Western Conference playoff seeding. That was enough for McGrady to do whatever it took to win this game. Coach Rick Adelman knew they would need McGrady to step it up, especially without Landry to keep the Hornets off balance. McGrady delivered in one of the best performances I’ve seen from him, which is saying a lot given how well he has been playing during the streak. 41 points on 17-of-27 shots. 3-of-8 from three-point land, 9 assists, 6 rebounds, and 2 blocked shots. And he played all 48 minutes. Yao Ming goes after one of his game-high 14 rebounds in a game where the Rockets made a statement by beating the Western Conference leading New Orleans Hornets. Yao would also finish with 28 points on 12-of-21 shooting as the Rockets on their 11th game in a row. Click here for more photos from the game. I admit that I’m very cautious and conservative when it comes to heaping praise on the Rockets. We have learned from past experience that right when you want to get excited about the idea of the Rockets dominating the league (remember that 6-1 record to start this season? ), reality sets in followed by a big letdown. So during the Rockets’ recent 10-game winning streak, I haven’t been completely convinced the Rockets had proven much since none of their opponents were world-beaters. I would bet many of the players felt the same way. That’s why the Rockets game against the New Orleans Hornets on Friday night was HUGE. If the Rockets lose the game, then we would know we still need to keep our optimism at safeguarded levels. If they win, then it would be a statement game to the rest of the league, and themselves, that they are for real. And maybe it would give everyone peace of mind that it’s okay to start getting a little crazy. No better place to start a party than in New Orleans, right? That’s exactly what the Rockets did, dominating the Hornets in their own gym 100-80 to win their 11th straight game. And the way the Rockets did it, I think it gives them even more confidence that maybe they can actually win the whole thing. After all, New Orleans is no slouch. They had a 5-game winning streak of their own coming into the game, and had won 22 of their last 26 by recently beating quality opponents like Dallas, Phoenix, Denver and San Antonio. Yao Ming shoots a long beautiful jump shot over New Orleans’ Tyson Chandler. Yao was geat in scoring 30 points, snagging 16 boards, and rejecting 4 shots, but the Hornets were too much to handle in an 87-82 loss, halting Houston’s 5-game winning streak. When thinking of providing my comments on the Rockets-Hornets game Sunday afternoon, I was going to try to do another podcast, but the pain in my shoulder is even worse, so I will just type up something brief here using one hand in shorter sentences. It took me longer than I thought to type this, so please forgive any typos. The Hornets were the better team Sunday in stopping Houston’s 5-game winning streak right when they started feeling good about themselves. They hit shots and the Rockets didn’t. Yao was a monster, scoring 30 points, grabbing 16 boards, and 4 blocks. He did miss some chip shots he would normally make, including a jump hook in the lane with 18 seconds remaining. But without him, it would have been bad. He also had a chance to tie the game with a 3-pointer, of all things, with 7 seconds remaining, but it fell just short. It would have been something if he had made it. Not only would that shot have been on ESPN Sportscenter, but he could have become a legitimate 3-point shot option for game-winning or game-tying shots in the future. Remember, with him being 7’6” and shooting a high trajectory shot like that, no one can block his shot from way out there. I think it was just as good of a shot as anyone else could have attempted. No one else seemed to be moving around to say “I’m open,” and Yao being the leader he is, he took on the responsibility. It wasn’t meant to be. 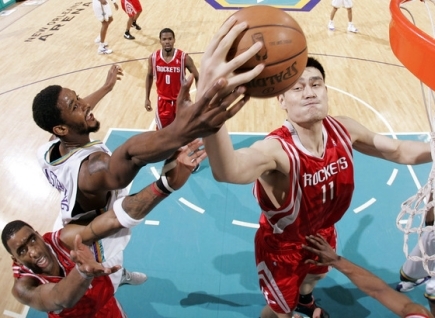 Yao tries to defend the Hornets’ sensational point guard Chris Paul Saturday night in Houston. The Rockets beat New Orleans/Oklahoma City for the first time this season, which was big in the Rockets’ quest to win home court advantage against the Utah Jazz in the first round of the playoffs. Yao had 30 points in the win, while T-Mac scored 25, including 11 in a row in the pivotal fourth quarter. Click here for more photos from the game. Click here for pregame photos during the shootaround. What else can you say about the Rockets’ 123-112 win against New Orleans Saturday night in Houston? It was one of the biggest wins of the season in defeating a team that had beaten them each time this year, and kept the Rockets’ quest to win home court against the Jazz in the playoffs alive. The Rockets and Hornets were trading blows all game long like it was a prizefight. But not until the fourth quarter when T-Mac went on a tear to score 11 points in a row did the Rockets put the game away. T-Mac finished the game making 8 of his last 9 shots, and 9 of his last 11, after only making 2-of-7 in the first half. Just like T-Mac had iterated in a Houston Chronicle article on Friday that now “it’s time,” he put his money where his mouth was and came through by hitting huge buckets when the Rockets really needed them. He essentially willed his team to a win down the stretch. The Rockets needed all the help they could get because they couldn’t stop the Hornets’ offense. The Hornets were incredible, racking up 62 points in the second half, the highest number of points the Rockets had given up in a second half all season long, and shooting 54.2% from the field for the game. David West scored 33 (his third 30+ point game in a row), Marc Jackson 22, Devin Brown 21, and Chris Paul 20. And they did all this without Desmond Mason, and potential most-improved-player-of-the-year candidate Tyson Chandler (sore big toe) who can give Yao problems down in the post. It’s hard to believe the Hornets aren’t going to make the playoffs. Their 37-43 record is not indicative of how good they are. That just goes to show how competitive the Western Conference is this season. But some years are like that. I remember during the Rudy T. era the Rockets finished 45-37 one season, and they still missed the playoffs, which was one of the best records for a team that didn’t make the playoffs. 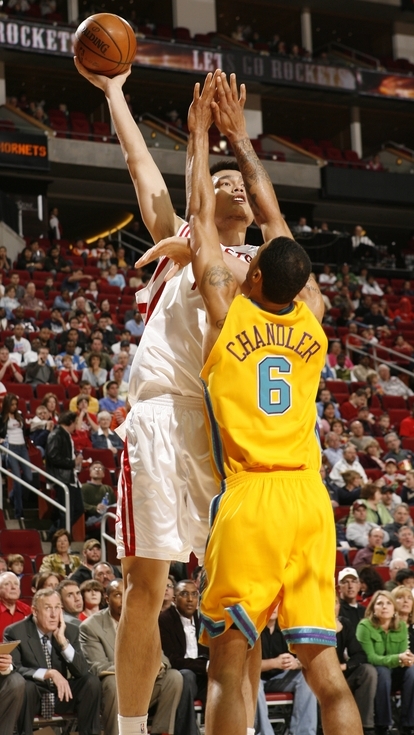 Without Chandler in the lineup, Yao had his way with one-on-one defensive coverage on him most of the night. 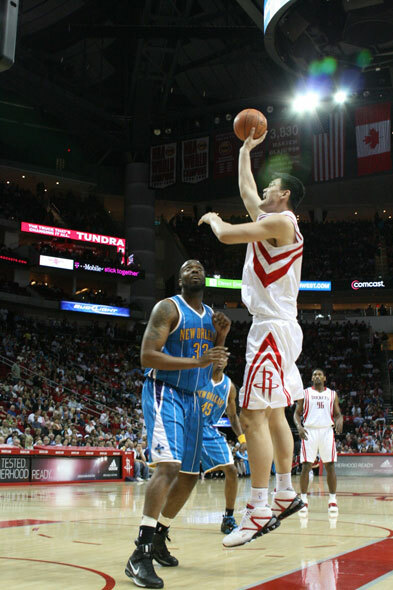 Yao scored 30 points on 11-of-16 shooting, and 8-of-11 from the line. He also had two blocks. But the one stat that several people (sportswriters, Van Gundy, even Yao himself) made fun of was his two rebounds. The Hornets’ Tyson Chandler takes it strong to the hole against Yao Ming Sunday night in Oklahoma City. Chandler got the better of Yao statistically, and his team also got the win. Click here for more photos from the game. The Rockets-Hornets game Sunday night tapped my emotions from the highest high to the lowest low. In the first quarter the Rockets were that well-oiled offensive machine we have grown accustomed to seeing lately in the first quarter of games. As a team they made their first 7 shots. Yao started off 4-for-4 from the field. T-Mac hit his first five. The Rockets moved the ball around for open shots, resulting in 12-of-21 shooting and a 10-point lead at the end of the first quarter, 30-20. Good job. The Rockets we’re on their way to finally getting the Hornet “monkey” off their back, a team they hadn’t beaten this season in two previous match-ups, and hadn’t beaten in 4-of-5 attempts the past two seasons. This was the new Rockets we were watching. That underachieving bunch of the past was the old Houston. This was going to be another “statement game,” one of several they have had this season that seemingly holds so much promise in the playoffs. But then it all came tumbling down. The Rockets fell into some old patterns and folded like a tent, losing 106-94. Yao’s shot inexplicably left him, and he ended up missing 15 of his last 18 shots. That’s unheard of. I can’t believe it. Yao scored only 16 points on 7-of-22 shooting, grabbed only 7 boards, and had 1 block. Meanwhile, his opponent Tyson Chandler scored 14 points, but only needed 11 shots to do it (he made 6), and he grabbed 10 boards and blocked 3 shots. Part of the reason Yao was having a hard time was because the refs kept calling fouls against him, but no fouls against his defenders who hacked away without fear of a whistle blowing. Yao only went to the line an unbelievably low TWO TIMES! What the hell is going on? In the 10 games since his return from his leg injury, he has averaged going to the line 8.2 times. RONNIE NUNN — WHERE ARE YOU? You are currently browsing the archives for the vs. New Orleans category.